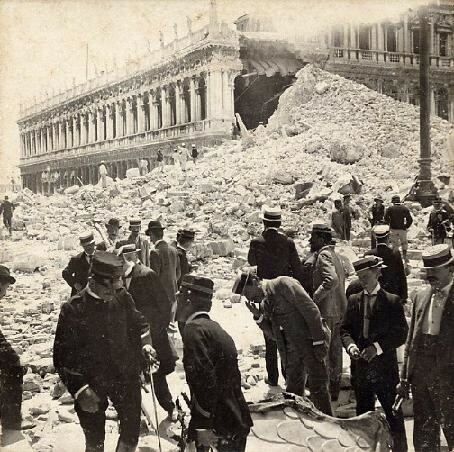 July 14, 1902 is a sad date for the city of Venice. 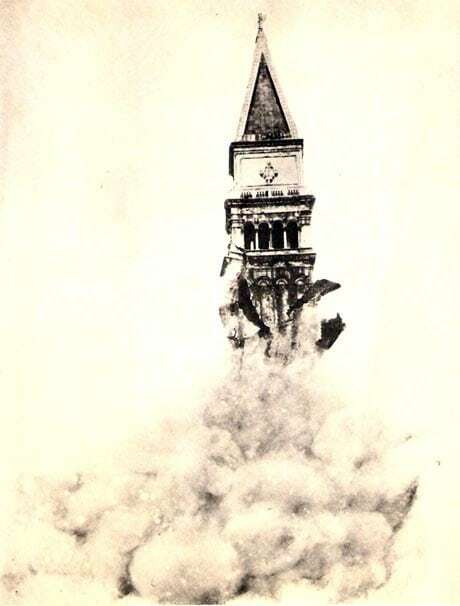 On that day, the Saint Mark’s Bell tower, one of the world’s oldest bell towers, collapsed. As luck would have it, there were no victims in that tragic event. However, when workers removed the rubble, they found a small victim, the custodian’s cat! Among the ruins of the bell tower, they also found nearly intact a bronze statue by Jacopo Sansovino depicting Mercury: the right arm was broken and without four fingers. 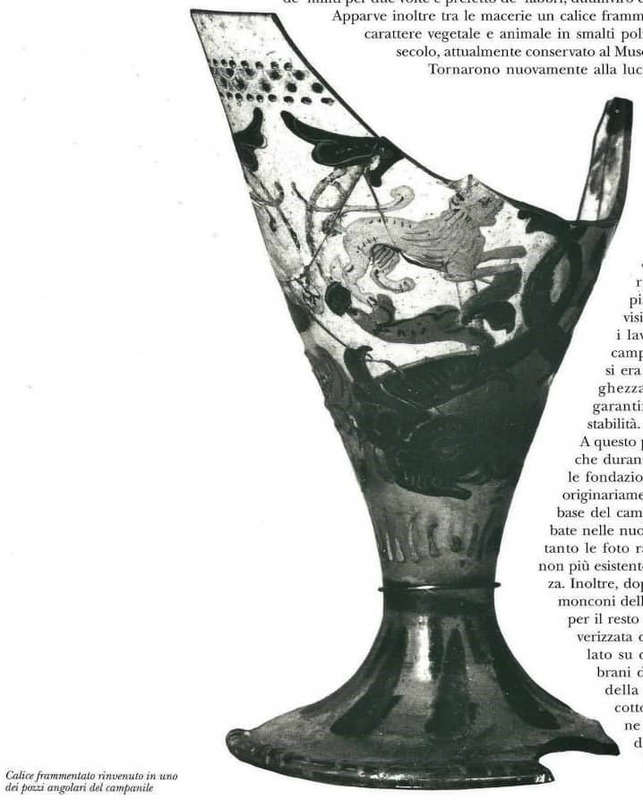 Moreover, they found a fragment of a Murano Glass chalice dating back to 1500, richly decorated with polychrome enamels depicting allegorical motifs of plants and animals, currently kept in the island of Murano’s Glass Museum. 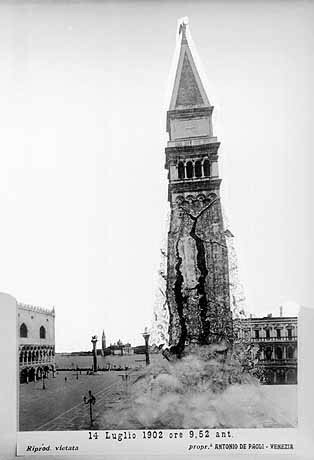 The collapse of St. Mark’s Bell Tower was a tragedy for Venetians, because it was a symbol, a flag, a piece of soul of the entire Venetian population, built in the heart of the city as a testimony of a story of life and art. 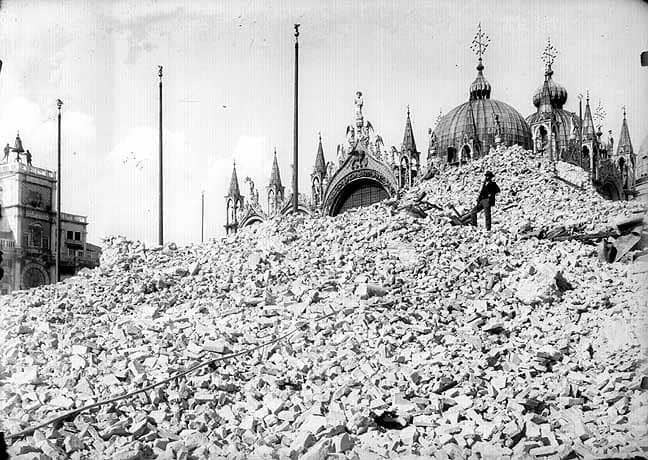 The rubble of the tower was thrown into the sea, about five miles from the Venice Lido. One brick, surrounded by laurel branches, was engraved with the date “July 14, 1902”. “It was like watching a funeral procession,” the chronicles of the time said. A little girl named Gigeta, on the boat with Giacomo Boni, a government official, threw the engraved brick into the sea. During the return trip, Boni noticed that Gigeta held her fist closed: the child had kept a piece of brick of the bell tower.